As someone who has lived in California for almost 30 years, I am impressed by barbecue aficionados who live in colder, northern climates. Oftentimes I find that these grilling fans are more zealous than those of us who live in places where removing snow or ice from a backyard grill is a non-issue. I encountered this type of enthusiasm a couple of weeks ago when I was in Minneapolis with my son (a high school senior) who was checking out potential colleges in the land of 10,000 lakes. While walking through the fashionable Uptown area, I stumbled upon a crowd watching a cooking demo of the Big Green Egg in front of Minneapolis’ independent cooking store, KitchenWindow. It was a blustery day just a week before Easter and temperatures barely hit 45 degrees. 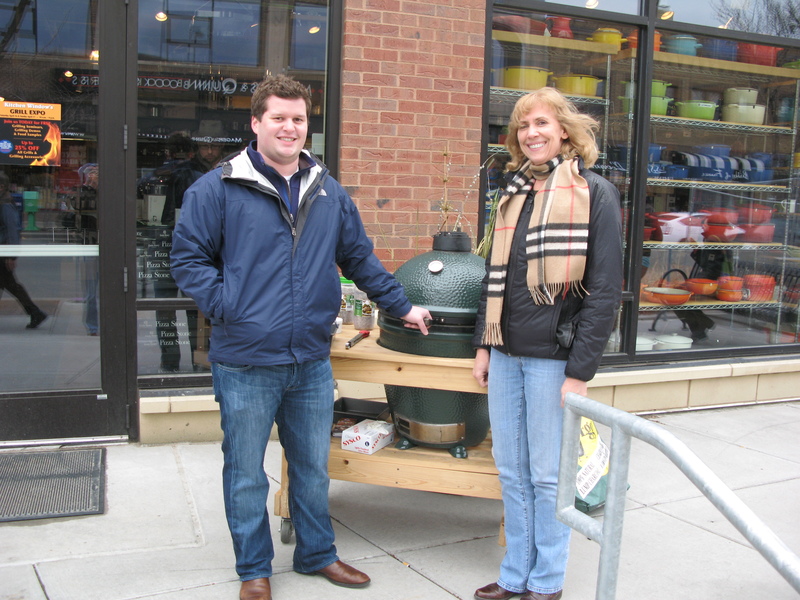 The cold spring weather (even by Minnesota standards) didn’t stop a crowd from gathering in front of the store as Brady Johnson, representative from Northern Plains Distributing (Fargo, North Dakota), cooked up a batch of juicy chicken wings on the Big Green Egg. As the wind ripped through my jacket, I was amazed that the weather didn’t stop these locals from standing outside for a 15-minute cooking demo. Clearly, the sights and smells from chicken grilling were too irresistible to pass by. Some had never seen a Big Green Egg before and those who were familiar with it wanted to check it out more closely. The crowd became very engaged with one another as they exchanged tips and stories about grilling, which created a fun vibe outside the store. The demo clearly increased foot traffic into the store as shoppers sought out more information about the Big Green Egg and other products. If a cooking demo is a success in cold climates, it can only be a hit in locations with milder weather. If you have never conducted a grilling demo or class, now is the perfect time to do so as we continue to experience warmer weather in the weeks and months ahead. And don’t forget: May is National Barbecue Month!